What can I do with a bucketful of squash? 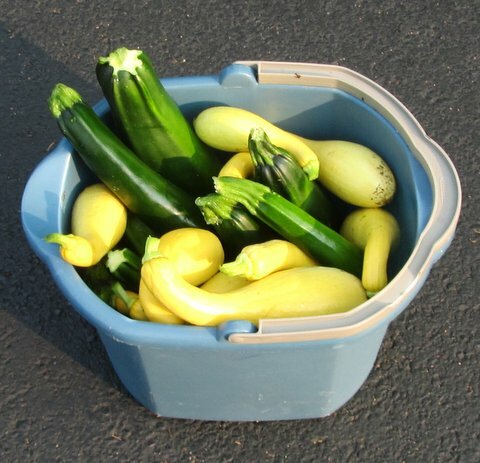 Yellow squash and green squash—Pic-N-Pic and zucchini—a bucket full of squash—actually another bucket of squash. Neighbors grimace but do their duty and reluctantly take “just one or two” while proclaiming, “We aren’t great squash fans” or “We’re not doing much cooking these days.” Our daughter takes a half dozen—which she slices lengthwise and grills with a bit of olive oil and seasoning. Our son, Brian, and family are visiting, and Deena, his wife, loves squash. How great is that! Ellen and I eat more than our share—and then some. We have two basic recipes—one simple and mouth watering and one smooth and comforting but more complex. The simple recipe: Place some butter (or olive oil if your cardiologist is looking over your shoulder) into a saucepan and add a half cup or so of chopped onion and two or three thinly sliced garlic cloves. As the onion and garlic begins to cook over medium heat, add one small yellow squash and one small zucchini squash cut into uniform pieces. Season to your taste—a little salt, a little black pepper, maybe a creative dash or two of dill weed fresh from your garden or from your spice rack. Cover and let cook just enough so the squash is a still a vegetable and not hot gelatin—just three to five minutes—stirring a time or two. The comfort food recipe: “Summer Squash Mushroom Casserole” from Taste of Home magazine. Since we are only two, we divide one recipe into two smaller dishes, bake both, eat one and keep the second in the fridge to reheat a day or two later. Key to this recipe: Barely sauté the squash so it doesn’t overcook and collapse while the casserole bakes. And here’s an unusual twist on squash from Barbara Damrosch’s “A Cook’s Garden” column, “A different delicacy: Squash vine tips,” in the Washington Post. To learn about “tenerumi,” CLICK HERE. And if I harvest another bucketful of squash, I’d better start thinking about Food Philanthropy and where I can donate our bounty, as Donna Koczaja posted yesterday. Please, if you have any left over produce, bring it to the master gardener veggie garden at the conservancy on any Wednesday.We are there on Wed. from 8 to 10 am working and then I take our weekly harvest to the foodbank. We would welcome the donations. The zucchini makes really great bread & butter style pickles – sliced thin, on sandwiches all year – Yum! Te Ball canning book has one recipe, I am sure there are others. I ended up roasting my extra squash this year and throwing it in the blender with tomato sauce after I cooked down my tomatoes. Because I didn't want to do it in a water bath canner with that much zucchini in it, I poured the sauce into gallon ziploc bags and stacked them in a casserole dish in the freezer so they would freeze flat. I pull out a bag whenever I need some sauce for something. It's worked out pretty well. Bob, this Food 52 recipe uses whatever summer squash you've got, is fabulous, filling and with a bottle of bordeaux, fit for an organically inclined king (or prince). Thanks also to the other comments. I need all the ideas I can get.